In conventional GIS, road links are represented by a centerline-based modelling schema which raises many difficulties in lane-specific transport applications, such as navigation, simulation, and visualization. To meet such lane-specific requirements, road network data model has evolved from centerline-based model, to carriageway-based model, and furthermore, to lane-based model. Varying in representation scale, each schema has its advantages and disadvantages, and no consensus has been reached on which one is more proper or efficient. The evaluation and selection of data model should be closely related to the application purposes and requirements. This paper examines the modelling strategies of the three schemas in the context of vehicle navigation. 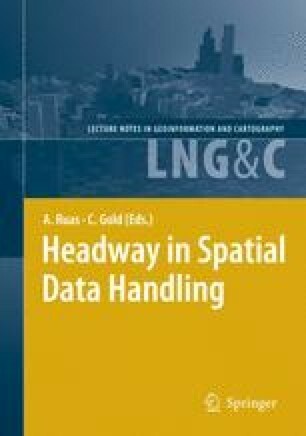 Based on navigation characterists, this paper further puts forward a GIS road network model which is not based on road object scale, but the driving direction that each road link provides. Compared with the other three modelling schema, this schema is more effective on topology maintenance, multi-cartographic representation, and data compaction.